The title of this post might lead you to think that I question the benefit of kids coding or programming. No. That’s not it. I am just hoping that you have developed your own good reasons why you want kids to code. Then, in support of those reasons, you set the wheels in motion for your students to achieve those goals. I invite you to tell your stories. Why do you want your students coding? When I started using computers with kids, in 1977, there were no applications to speak of! In fact, I didn’t even have a desktop computer. I rented a dumb terminal and ran a telephone line through the classroom ceiling to a phone in the school library. Why did I go to such trouble? It was about power. Locus of control. Social constructionism. I really wanted the students to ‘take charge of their own learning’ – but not just from a student agency perspective – but I also wanted them to develop magnificent metacognitive skills and to ‘fall in love’ with their ability to learn. Now for a little trip down memory lane. You know, I never thought I would use computers with kids. Back in the 70’s I was a ‘humanist’. OK – I still am! But computers were so mechanistic – however I decided to take a course with Ron Ragsdale at OISE. 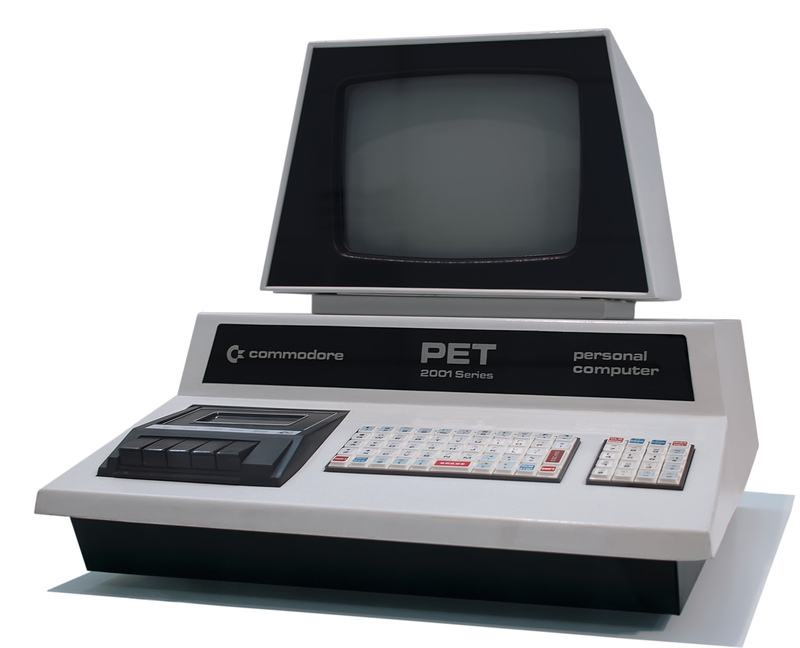 We used the Commodore Pet. We learned BASIC – there were really no programs available until a little later. So, after that evening, I was moved. 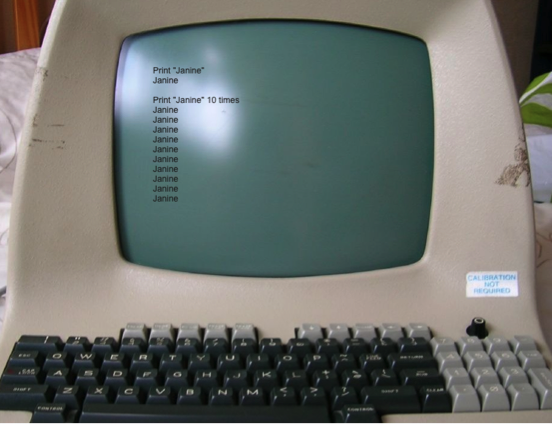 It was 1977 so I went and rented a dumb terminal for a month – for 70 dollars – and took it into my Grade One class. I hooked it up to a telephone line connected to OISE. I taught some grade ones to do simple programming in BASIC. You should have seen their faces!! They squared their shoulders… head their heads high. And they wanted to struggle some more! Did they each have a computer? No! Was that a bad thing? No! It was a social event. It was a ‘happening’. It was shared. They all had a stake in it… not just in what they did… but also in what the other kids did. 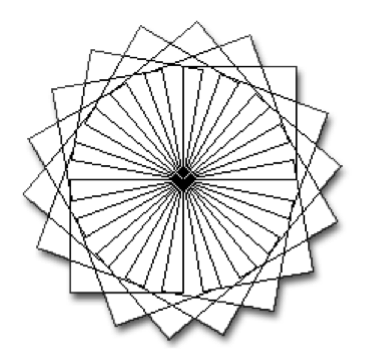 Similarly, an equilateral triangle can be made by having the turtle turn 120 degrees three times. 3 X 120 = 360 Or, repeat 3 [fd 100 rt 120] For a pentagon – 5 X 72 = 360 so repeat 5 [fd 100 rt 72] will do it! And so on. This simple arithmetic is the basis for the total turtle trip theorem. So, as an advance organizer or a ‘minds on’ as we might say today, I asked my grade twos, to write a story about a total turtle trip before we explored this ‘powerful idea’ on the computer. “Oh, but what if you fall and land upon your back?” his mother asked. When he was walking along he met Father Bunny. “Where are you off to on this fine spring morning,” Father Bunny asked. He was halfway down the road. He started down a big hill but he tripped and tumbled down, down, down the hill and landed on his back. Meanwhile, Turtle’s mother got worried and went to find him. She found him on his back. She helped him to his feet. Did she understand the concept? Let’s see. I asked the kids to make any polygon. I was amazed at what LeeAnne did. Why? Because she not only understood the concept at hand, but realized that she could have the computer do the division (360/11). So her instruction to the turtle was repeat 11 [fd 100 rt 360 / 11]. This made the creation of any polygon really easy! A pentagon was 360 / 5. An octagon was 360 / 8. If you ever wonder at the end of a day just what your kids learned while working at the computers and you are dissatisfied with your thoughts, consider the following simple model. Gavriel Salomon has posed an analysis of the difference between “effects with” and “effects of ” computers. In other words, the ‘effects with’ are the enhanced ability one gets from the use of technology. Salomon elaborates: “The combined product of human-plus-machine yields a higher level of performance.” The ‘effects of’ are the lasting individual changes resulting from the computer-supported collaboration, the cognitive residue, one might say, the transferable knowledge or skills. So, just how might you go about helping your students experience the ‘effects of’ coding? In Logo, as in other programming environments, you write procedures (or small programs), which may become part of larger procedures. The included ones, therefore, are called subprocedures , and the enclosing programs are called superprocedures . This is much like a builder using bricks that become part of a wall, which then becomes part of a house. For example, the procedure for creating a square can become a subprocedure inside a superprocedure for creating a flower. We were having a discussion inspired by the flight of the space shuttle piggybacked on a jumbo jet. Our Grades 2/3 class had the opportunity to watch the flight. When we return- ed to the classroom, a discussion of space naturally arose. One child asked if Earth was in space, and in asking the question, she determined it must be, because it wasn’t sitting on anything. The discussion continued until Jeffrey piped up. 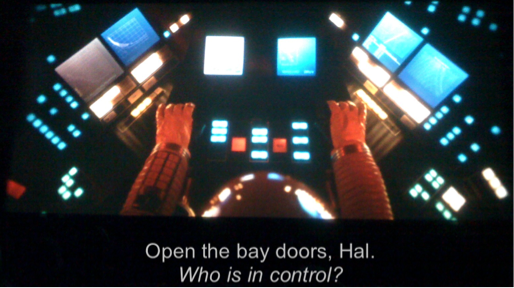 “Finding a bug in a program is like … ”. This is but one example that provides students with a mental model—a model that is durable and independent of coding. It is what Salomon would call a residual effect. One example of this residual effect became evident after the students’ experience with “bug collecting” during their time with Logo. They had learned that identifying problems in their Logo code meant that they had mistakes, or bugs, in their thinking. Of course, actively seeking bugs was a necessary component to getting the program to do what they wanted. Bug seeking naturally evolved into bug collecting. Every time a bug was solved, the kids squished it—metaphorically, of course! 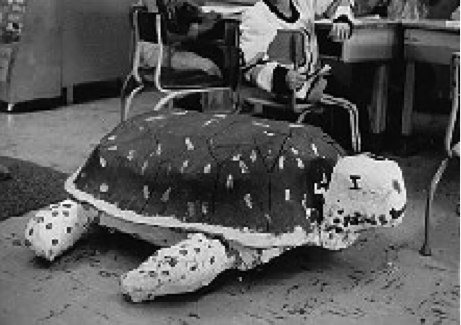 The class had built a large papier maché turtle, and one of the students suggested that perhaps when a bug was solved it could be fed to the turtle instead. This was delightful and useful in and of itself, but the transfer of this model became clear as I overheard two students working on a traditional paper math task. They knew their answer wasn’t right. I believe it is important to maximize the opportunity for the acquisition of these skills as your students are coding. Do not leave it solely to the use of the computer. Be explicit in building the bridge—in making the connection of this skill to other domains. Discuss them in class. Have students describe other situations where these skills might be used. In fact, take it one step further. Ask your students to think of particular aspects of that give them generalizable skills. In this way, you are empowering them to take more responsibility for their own learning. Have you any idea of my excitement in 1987ish whenever Seymour Papert, Brian Silverman, Mitch Resnick, Steve Ocko and others came up with the idea of Lego and Logo being used together to create a great robotics environment for kids? 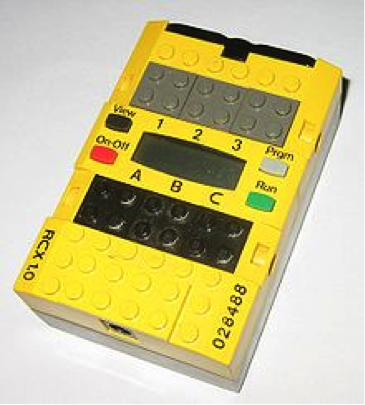 It was called Lego/Logo*** and was the precursor to Lego Mindstorms. I quickly purchased several dozen Lego Logo kits for use within North York Schools. We had some ‘hard fun’. One of the things I have always treasured in my meetings with Seymour was the twinkle in his eyes as he got energized by ‘powerful ideas’ for kids. One of these moments occurred regarding the intelligent brick. 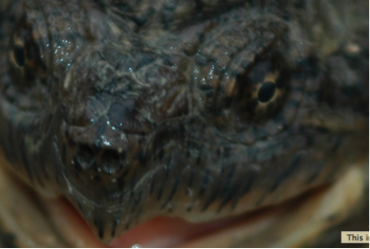 He was so excited about it at one point that he invited me to sit with him and his graduate students as they pondered and played with several of these turtles with embedded intelligent bricks. These turtles, of course, had sensors and lights and the discussion revolved around our creating a simulation of cultural differences. “People of different cultures are comfortable with differing amounts of personal space. What if we could program these turtles to move around with that in ‘mind’?” Turtles had different coloured lights on them and so the idea was to program each one to move within a specified distance of any other turtle depending on its colour. It was a great ‘problem’ to think about. It’s a far cry from walking into a classroom full of kids where they all have the same worksheet and are copying the code mindlessly into their computers – all to produce the same outcome into which they had no personal investment. In 1984, I became the president of SIG-Logo – a special interest group for the Educational Computing Organization of Ontario (ECOO). 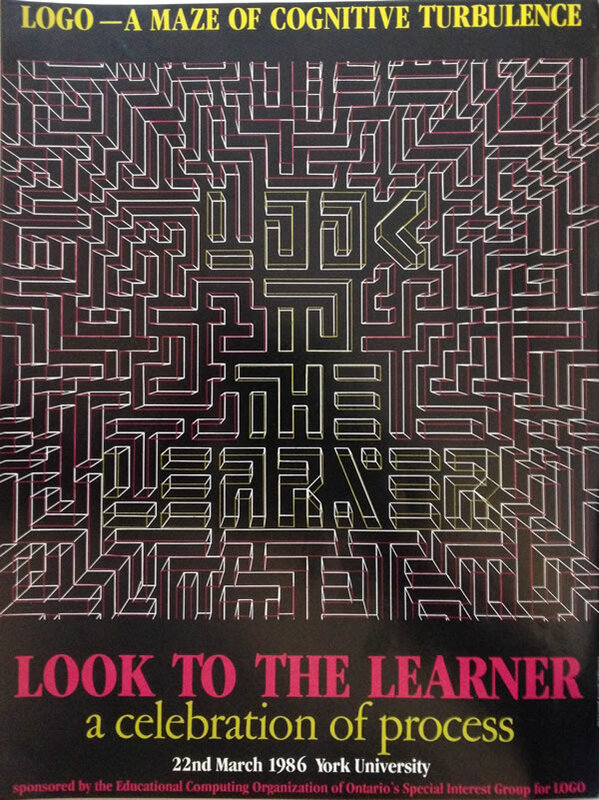 We ran a conference called Look to the Learner. It was extremely important for us to focus on the learner ‘being in charge’. At that time, as now, the educational computing community was under assault from those who wish to control children and to make them comply with their educational philosophy. It was the era of CAI – Computer Assisted Instruction. Or, as I called it – Computer Assisted Institutionalization! Another famous book of the time The Computer in School: Tutor, Tool, Tutee by Robert Taylor (1980)*****spoke of the computer as a tutor, tool or tutee – as the title suggests! The computer could tutor the student. The computer could be used as a tool – e.g., wordprocessing, graphics, etc. Or, the computer could be the tutee – and be taught by the student. To do this, the student must learn and understand how to speak to the computer in a language it understands – that is, coding! Here is the agenda for that wee conference – which stands out as a highlight of my years. Click these images for a larger view of the day’s sessions. This is a spectacular book by Sylvia Libow Martinez & Gary Stager. These pioneers have a long and significant history with kids and effective computing which places kids firmly in charge of invention and learning. 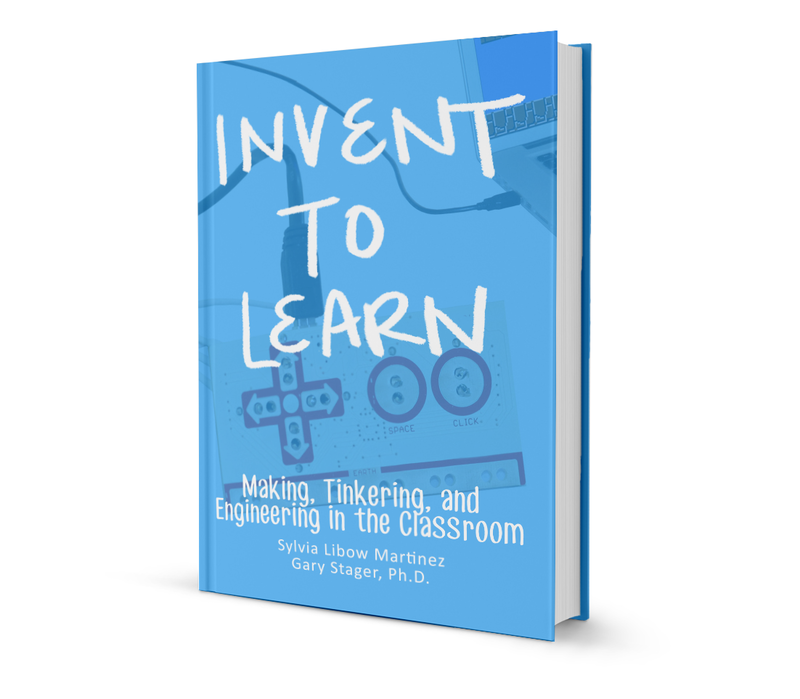 The book suggests that ‘using technology to make, repair, or customize the things we need brings engineering, design, and computer science to the masses. Fortunately for educators, this maker movement overlaps with the natural inclinations of children and the power of learning by doing’. David is also a pioneer in this field. He developed Calliope many years ago. It became Inspiration. He developed the Koala Pad. It was a precursor to the use of tablets. He suggests that ‘learning institutions should offer a balance of Campfire spaces (home of the lecture), Watering Holes (home to conversations between peers), Caves (places for quiet reflection), and Life (places where students can apply what they’ve learned)’. 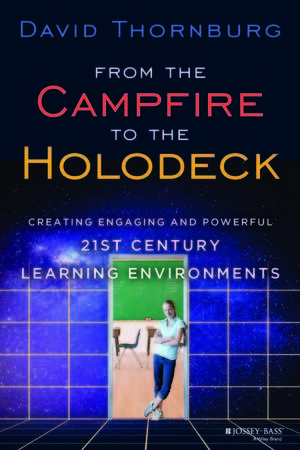 He wants schools ‘that encourage immersive student-centered learning experiences (Holodecks)’. It is not sufficient to equate ‘being in charge of one’s own learning’ with ‘student agency’. As we code with kids in 2013, we realize we stand on the shoulders of giants. We must have our own deep reasons for wanting our kids to code. I suggested, at the outset, that my reasons include both ‘student agency’ and helping kids to deeply understand learning. It is not sufficient to equate ‘being in charge of one’s own learning’ with ‘student agency’. Kids can not be in charge of their own learning if they do not understand the intricacies of learning and, indeed how they learn in different circumstances. Next Next post: To Question IS the Answer! Peter – thanks for such a thoughtful and information filled post here! And on the day of the #hourofcode as well! I’m sure that many folks, especially those new to the hacking movement will appreciate the references. I always admire you folks who were doing this stuff when it was really hard! New applications make it easy for teachers and kids to get started, but hopefully they persevere and find robust versions of tools so that kids can take the experience to the level they want. My experience with programming came first as a learner at University where I took a course called Computers in Psychology (circa 1986) and learned to program educational games using Waterloo Basic. That was back when the DOS screen just blinked the cursor at us…it was hard…but it was fun! Being in control was a key point, as you mention wanting for kids. Yes. It was harder then – technically! But, we had a culture in education that was more amenable to tinkering, experimentation, inquiry (real inquiry – not the worksheet variety I fear comes out of the institutionalization & shotgun, decontextualized implementation of these constructs!). That culture that trusted educators and students to engage in passionate, open education made it easier than now. I love your story about MicroWorlds Jr. Here we are – almost in 2014 – and we are still showing people Logo – because of the power it affords kids in many areas — including thinking about their thinking. That was a nice memory post, Peter. Thanks for doing this. I find it interesting how the premise behind LOGO has found its way into most of the languages that we find in education these days. Everyone’s looking to extend the wonderful learning experience that LOGO affords. The turtle has to be the least honoured symbol of programming. Even as I swipe to unlock my Android, there are times when I think of the instructions that I could give to a turtle to walk the path to perform the unlock. Underlying all of this though is the true learning that happens. As I posted recently, it’s not simply just getting the task done. It’s the important message that you can be in charge and you can make the device do your will. At every turn, we see technology in place and we need to have, and we need to encourage students to have, the understanding that they are in control. What better testament to the humble turtle. Yes, it is awesome to see coding as a phenomenon right now. You say, “I find it interesting how the premise behind LOGO has found its way into most of the languages that we find in education these days”. I hope that people deeply consider more than the ‘student agency’ – the ‘student in control’ issue. As important as that is (being a Summerhill guy at heart), I hope people will start talking more about how they are scaffolding the coding environments to help kids to develop thinking skills, metacognitive skills, transferable skills and so forth. What I hear about mostly is ‘student at the centre of the learning’ – which, as I say, is great – but, I want to hear more from folks.